New Food Quest: Bring On the Beignets! Everywhere I look lately I’m seeing beignets – on a dessert menu at a restaurant where I’d least expect to see them, on the Cooking Channel (do I watch it too much or is it food blogger research? ), and on Pinterest. I haven’t had beignets in YEARS. I think the last time I had them was at the Big E. But you know that feeling when you have forgotten about something and once you remember it you seem to see it everywhere? Yeah, that’s what I’m experiencing with beignets. A few sightings has led to a beignet craving and the realization that I have absolutely no idea where one can purchase delicious beignets in Connecticut. Say hello to my new food quest – BEIGNETS! 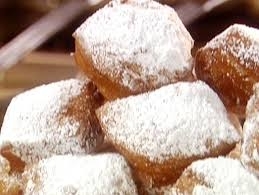 Before I try the Paula Deen recipe I found online (this picture is from her recipe on the foodnetwork.com) and make my own beignets, I want to hear from you! Do you have a place in CT where you go for beignets? Hehehe. Yay, now I’m not the only one!